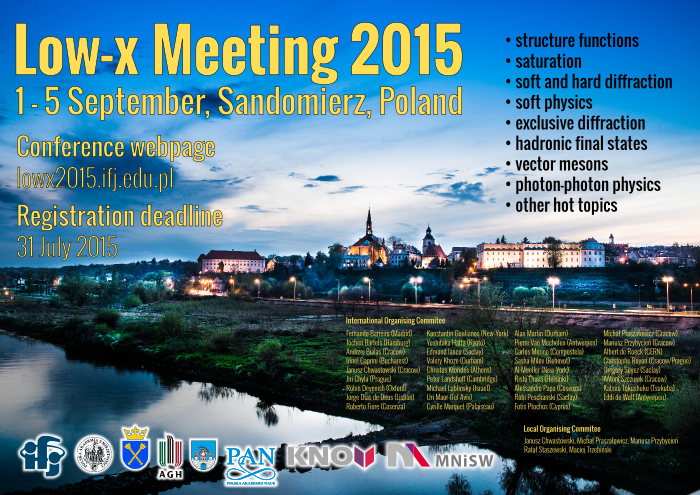 The 23rd Low x Meeting will take place in Sandomierz, Poland, September 1-5, 2015. This meeting follows the earlier ones held at DESY, then Saclay (May 1994), Cambridge (July 1995), Durham (June 1996), Madrid (June 1997), Berlin (June 1998), Tel Aviv (June 1999) Oxford (July 2000), Cracow (June 2001), Antwerp (September 2002), Nafplio (June 2003), Prague (September 2004), Sinaia (June 2005), Lisbon (June 2006), Helsinki (September 2007) Crete (July 2008), Ischia (September 2009), Kavala (June 2010) and Santiago de Compostela (June 2011), Cyprus (June 2012), Israel (June 2013) and Japan (June 2014). The spirit of this series of meetings is to favour fruitful and informal discussions between experimentalists and theorists. A considerable part of time is devoted to discussions on new results, hot topics and exciting open problems in QCD at colliders. The 23rd Low x Meeting 2015 is supported by: Polish Academy of Arts, Institute of Nuclear Physics, Jagiellonian University, AGH University of Science and Technology, Marian Smoluchowski Kraków Research Consortium - KNOW, Polish Ministry of Higher Education.